Frank Lampard is in line to captain England in Saturday's friendly international against world champions Spain. According to reports, however, coach Fabio Capello appears determined to start John Terry in the fixture three days later against Sweden. Capello is adamant that despite consulting the Football Association on the matter it was his sole decision to select Terry. In terms of squad seniority, Ashley Cole should be considered but he has already told Capello he does not want to captain England. The manager is also keen not to pass the armband around the squad on a one-off basis. 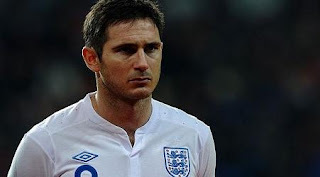 It is understood Capello will turn to Lampard if he trains well this week, which will complete a remarkable turnaround for the 33 year-old, whose own England future has been in some doubt. Lampard captained England in the February friendly away to Denmark but has since struggled to convince Capello he should be a regular starter. After the Copenhagen fixture Capello decided that Terry should be restored to the captaincy having had the honour stripped from him after his alleged affair with Wayne Bridge's former partner. The decision by Capello to select Terry in this squad, but revealing he will not play against Spain, means the Chelsea player will not have to face the media this week and could also mean that the FA are hopeful that the police may conclude their investigations into the Anton Ferdinand racism case before the following fixture.